How old are the homes in Newpoint? Although the homes in Newpoint look as if they were built many years ago, the development was begun in 1991. Newpoint was modeled after the Point neighborhood of historic downtown Beaufort. Houses with welcoming front porches and understated Southern charm invite residents to get out of the car and experience the town on foot. It is this combination of architectural style and pedestrian orientation which makes towns like Charleston, Savannah, and Beaufort so enticing to visitors. As in the historic Point, homes in Newpoint sit on smaller lots, which contribute to a welcoming sense of community. The historically inspired homes are located on curvilinear tree-lined streets. Is Newpoint within the Beaufort city limits? Beaufort's city limits extend across the swing bridge (Woods Memorial Bridge) and down Sea Island Pkwy (U.S. Hwy 21) as far east as Distant Island. The majority of Lady's Island, including Newpoint, is not in the City of Beaufort and Newpoint residents do not pay city taxes. In which school district is Newpoint located? Newpoint is in the Beaufort County School District. Coosa Elementary has grades pre-K through 5th. Lady's Island Middle School is grades 6 through 8, and Beaufort High School is 9th through 12th grades. There are several private schools near Newpoint. Beaufort Academy admits students pre-K through 12th grade. St. Peter's Catholic School enrolls 3 year olds through 6th grade. Sea Island Presbyterian Day School admits students ages 16 months to pre-K.
How far away is Newpoint from Hilton Head, Savannah and Charleston? I've seen people walking and jogging in Newpoint. What are the distances? If you take the outside route (the alleys behind the homes) and include the walk across the common area bordering Factory Creek, it's about 1.1 miles. 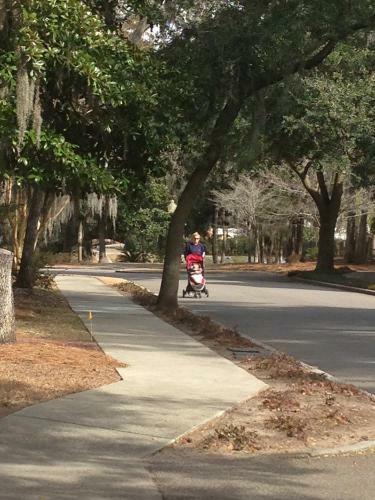 If you stay on the sidewalks circling the community, it's about .8 miles. What type of people live in Newpoint? Newpoint has its share of doctors, lawyers and business executives. But you'll also find young military families and retirees from all over the country. Strike up a conversation with a Newpoint resident and you'll realize why this is such an engaging place to live. We have artists of all sorts, including painters, photographers and jewelry makers. There's a ballerina. A Formula 1 race car driver. A rock-and-roll star. An Emmy award-winning broadcaster. A romance writer and a college professor. Sailors and salespeople. Beaufort natives as well as transplants from around the world. Newpoint is perfect for families of all kind, of all ages. Is on-street parking permitted in Newpoint? Yes, for short periods of time for loading and unloading as well as to accommodate guests. But remember: Newpoint is designed with an emphasis on people rather than automobiles. Our streets are narrow to encourage a sense of community. We also have sidewalks on both sides of our streets. Garages and driveways are oriented to the rear of the properties, minimizing the intrusion of cars while people are walking, biking and jogging. We encourage residents to park their cars in their driveway or behind their home whenever possible and require them to do so overnight. Aesthetics aside, there is a safety factor. Because the streets are narrow, the Lady's Island-Saint Helena Fire Department said it is safer for emergency vehicles to travel the streets without the impediment of parked cars. Does it ever snow in the Beaufort area? Just often enough to make it magical. We received three inches of snow in early January 2018. 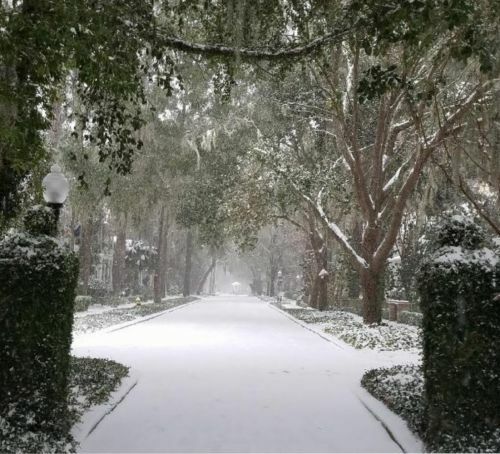 It was the first time the Beaufort area was blanketed in measurable snow since February 2010. One Newpoint homeowner was so excited by the "snow storm" she got out a sled (Looking at you, Teresa). And another, an ex-Yankee, was seen using an actual snow shovel. Most everyone else used a broom to clear the white stuff off their porches. Suffice it to say, snow is a rarity here. To be more precise, there have been eight total snowfall events in Beaufort County in the past 53 years, according to South Carolina State Climatology Office data. The county has a 9 percent chance of seeing snow every year and only has seen five years on record with snowfall over .1 inches.